We saw you all, every single one in July and August and now you are gone, the stocks are low and we are trying to keep our spirits high. Not so difficult because summer takes a breath at the beginning of September, there is a natural pause. All the burning hot long days are dissolving into damp dewy chillier mornings and earlier cooler evenings and a change is clearly in the season and in the air. We wave you off, the last of our own summer visitors today just as the swallows are dipping and chasing and practising their loop the loops across the fields, landing on the telegraph wires and seeming to chat to one another. Grandpa sits in his chair with his feet up reading the paper then falling into the sort of sleep that Grandpas need after a long summer of entertaining and gossiping with sons on the front step with an evening cigar and perhaps a glass of this or that. There is comfort in tidying up, it keeps sadness away when you have all gone. The fridge is full of leftovers, little bits of slightly wrinkled green pepper and a few old pots of yogurt, well past their sell by date. The best leftover of the lot though is the once teeny tiny space ship baby, now pointing things out and wandering around finding new words every day, new skills and developing distinct character. She and I get to spend this leftover day together and we end up with a leftover ice lolly together on the front steps. There is nothing like this time of year for peacefulness, all the rush has settled down, most of the harvest here is in, GCSE results and A Level results with their attendant joy and relief or the opposite are delivered; jobs which change location are mostly in place and I am absolutely desparate to get back to regular meditation which doesn’t have thoughts of washing or food preparation. 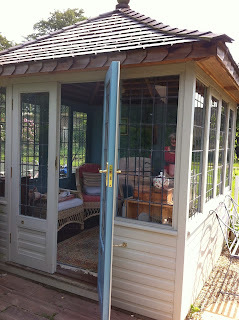 I feel the pull towards the early morning summer house quiet right through me and tomorrow will be the day!